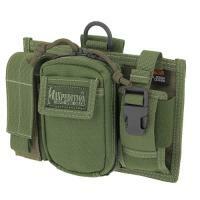 The Maxpedition Triad Admin Pouch combines three useful accessory compartments into one versatile platform. It can be attached to MOLLE or PALS webbing using three-inch TacTies, making it compatible with a wide range of equipment. In the center, a zippered pouch contains accordion dividers for organizing small items, and it also features an external front slip pocket with a flap closure. It is flanked on the left by a sheath pocket with an adjustable flap that fits a knife, flashlight or pistol magazine securely. On the right, a specialized side-release buckled pocket provides space for a cellphone or radio up to 5 inches tall, and includes a gap for the antenna. The back panel contains a flat pocket with internal elastic retention loops.